The Redbud Garden Club meets on the first Monday of the month, from October to June. See program directory below for a complete list of programs and locations. Board meeting times will be set as needed by the President during the year. Meeting dates and places will be announced at Club Programs. The Redbud Garden Club begins its 2018- 2019 season welcoming back members and extending our welcome to new members. We will meet at Anne Langs at noon to have lunch and our first meeting of the year. The garden club will be paying for members’ lunches. Spouses and significant others and guests are welcome. Members will bring an appetizer. Hostesses will bring dessert. Bring a gift for the gift exchange gift ($20 limit) and fabric or other donations for “Comfort for Kids”. Melanie Keeley, Native Plant Specialist, Sequoia/Kings Canyon National Parks, will give the group a tour of the new greenhouse at Ash Mountain. Pack a lunch and dress for the weather. Members will travel to Tulare for a tour of the new million dollar College of the Sequoias nursery and Plant Science & Technology Facility. Bring your lunch, dessert and drinks will be provided. Plants will be offered for sale to members. Members will assemble color bowls to be sold at the annual plant sale. Please bring plants, herbs, soil, gloves, tools, and any other additions you would like to add to customize your color bowls. Bring a drink and snack if you wish. 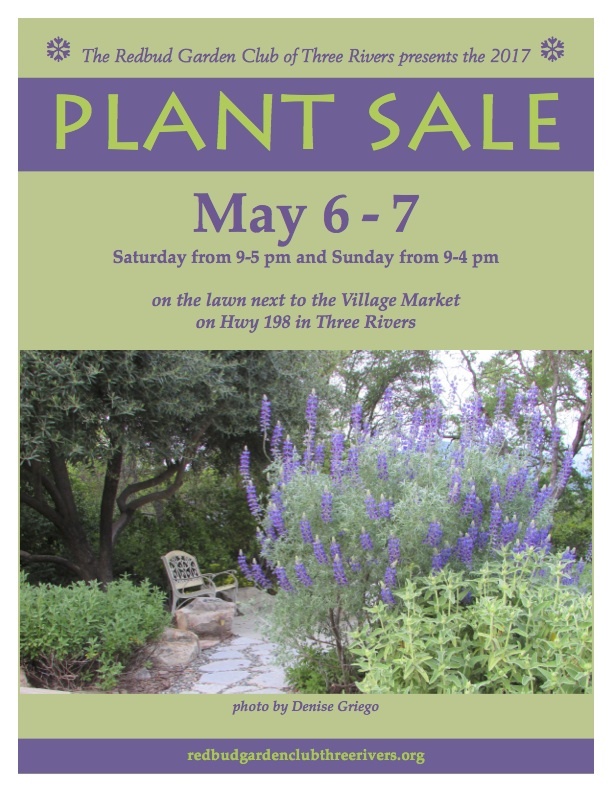 The sale will be held on the lawn next to the Village Market in Three Rivers. There will be a celebration BBQ on Saturday night. Important meeting to discuss plant sale overview and the slate of officers for next season. Our last meeting of the season will include a catered luncheon (to be paid for by the club), installation of officers and a wrap-up of the year’s business.